After all the craziness in Bangkok and Phuket, Kim and I were looking forward to taking it down a few notches and relaxing on some of the small islands of the Krabi province. First stop was Phi Phi Island. With some advice from fellow travelers, for the first time on this trip we arrived with no reservations for accommodation, as we were told that the island was quite small and we could easily find a place to stay just walking around a bit. This was a big step for Kim, the planner! But we found a home for the next 5 days without a problem. It even had a TV with an awesome movie channel. Pretty Woman, Before Sunset, The Last Unicorn….it was so nice to lay around and watch TV before bed, something we hadn’t done since Buenos Aires. We spent our week wandering around the tiny center, chowing down on delicious Thai food, and sunbathing on some of the most beautiful beaches in the world. The island has two beaches — one side is mainly a pier where the ferries, longtail boats and private watercraft come in and out of the island and the other is the main beach where most people hang out. Both sides are lined with cute little restaurants, bars, and shops. We hiked up to the view point via the Tsunami evacuation route that gives a perfect overlook of both sides of the island. 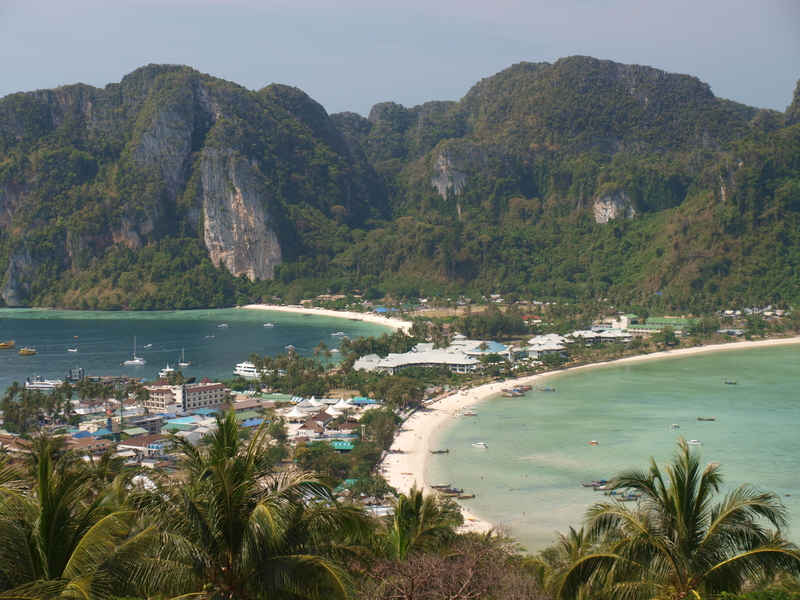 A photo of Phi Phi just four hours after the tsunami hit is posted up on a tree…it’s crazy to see the difference between that photo and what it looks like today. 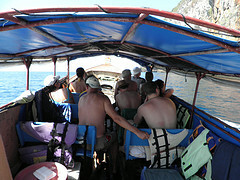 Another day, we decided to do the “Seven Islands Tour” that was recommended by a friend we met on the ferry. It was one of the best tours we have done on this trip. Captain Dang (and his awesome sunglasses) took us on his long boat to an amazing lagoon with translucent water, surrounded by limestone cliffs, where we took turns jumping off the boat and did some swimming. 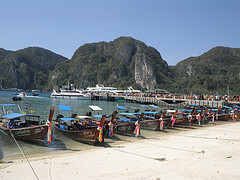 Then off to Maya Bay where they filmed the movie, The Beach, for lunch where we were able to work on our tan. After lunch, we headed over to Monkey Beach to feed the monkeys and do some snorkeling. For our last stop, we took a long ride to Bamboo Beach. Kim laid around while I collected coral and sea shells for my friends’ kids back at home. 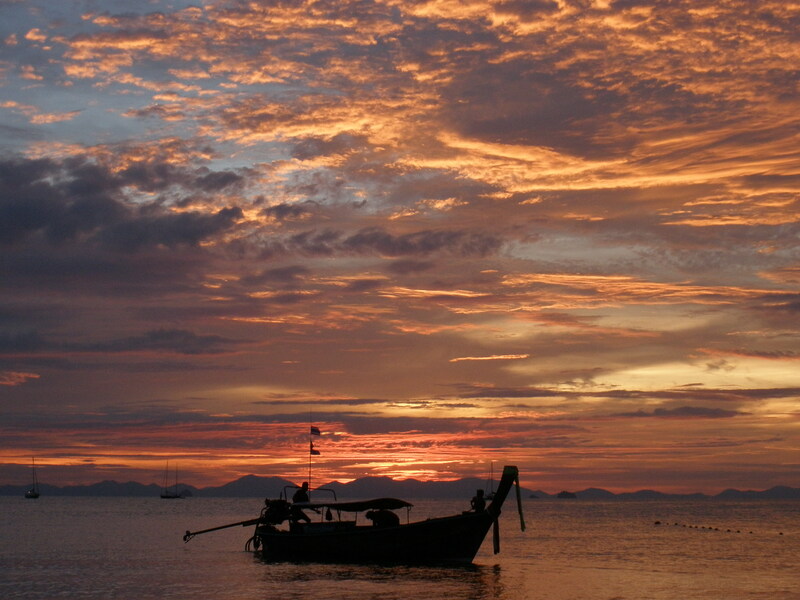 Because of the way Phi Phi Island itself is shaped, you can’t see the sunset from either coast. 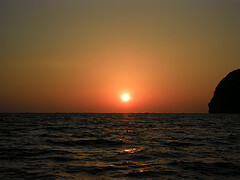 However, on the way home from our tour, Captain Dang stopped us right in the middle of the ocean to watch the sunset. It was such an incredible day. Kim and I both really loved Phi Phi. There are a ton of tourists on this island, which is why some travelers claim to dislike it, but it’s definitely worth seeing in our opinion. 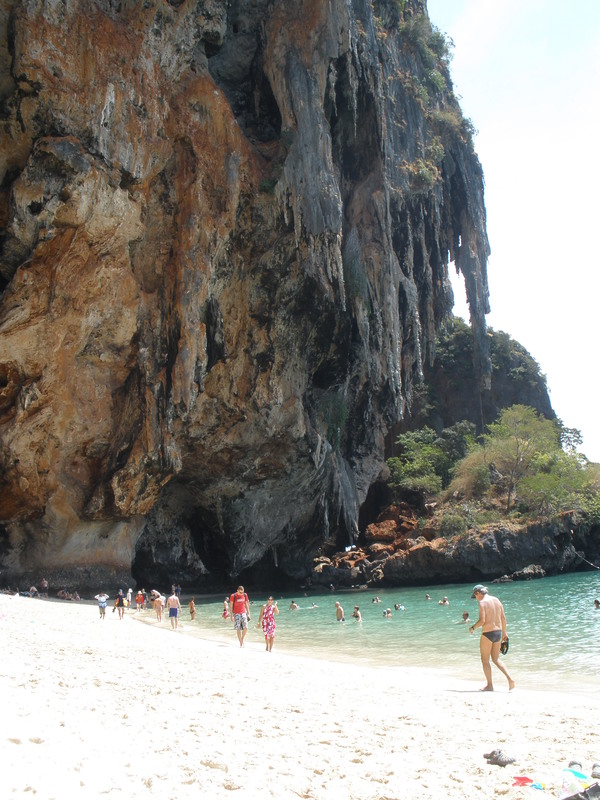 However, we did want check out one of the even smaller islands of Krabi. I’m sure I have said this a lot over the past few months but Railay (or Rai Leh) was one of my favorite places we have been on this trip so far. Ah! It just keeps getting better! 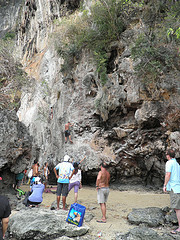 This island is reknowned for it’s rock-climbing trails and has two sides of beaches as well. 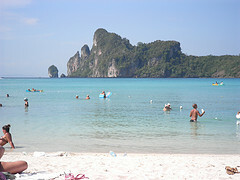 On the west end, there is a fantastic beach and all the resorts, a hot spot for honeymooners. Take a short walk over to the east side for the backpacker friendly accommodation and cheap restaurants and bars (obviously this is where we stayed). The beach on this side is all mangroves and not suitable for swimming, but just head south about 10 minutes and a trail will lead you to the picturesque Tham Phra Nang Beach, perfect for laying out, taking a dip or getting a dirt-cheap foot massage right on the beach, which I totally took advantage of. Best $4 I’ve ever spent! We spent 3 days here relaxing on the beach, watching the rock climbers do their thing and hanging out at what might be my favorite bar in the world – Skunk Bar 2. Great staff, great drinks, great music (most of the time) and a SUPER laid back atmosphere. 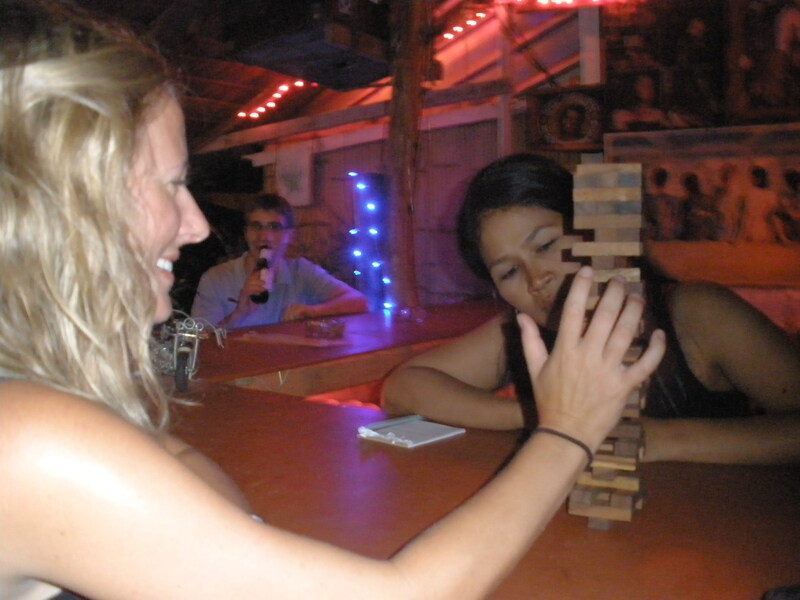 Every night we got our butts kicked in Jenga and Connect Four. I don’t know what it is about the Thai’s, but they know their games…it’s like winning strategies are ingrained in their heads as a toddler or something. Never bet money on Connect Four in Thailand. They will annihilate you! Kim and Pat, our bartender. As you can see, he has a tough job. One night we were having drinks and playing Jenga with the staff when all of a sudden, two men with plastic badges around their necks came into the bar. Everyone got quiet, the music was turned off and it was obvious that there was something quite serious going down. I looked around and everyone was putting out their “left-handed cigarettes” (that they purchased at the bar) and trying to act cool. Of course all the conversation was in Thai, so none of us knew what was going on. The two men went behind the bar and started going through…all their CD’s?? Yeah, they were some kind of pirated music police!! They took all the copied CD’s they could find, had some words with the owner and left. What?!! The bartender, Pat, explained what had just happened and then assured everyone they had copies of the copies that were just taken and there would be tunes back on in no time. It was hilarious! 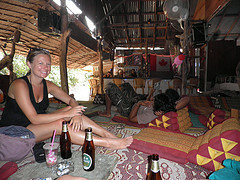 Smoke all you want, drink all you want, but don’t get caught with pirated music in Railay! After our chill days in this wonderful place, it was time to get ready for the madness that we knew was coming. After an entire day of traveling by long boat, mini-bus, public bus, and ferry to the east coast, we would arrive in Koh Phangan for the infamous Full Moon Party….